Affairs of Honor – It's Hamiltime! “…the tour’s highlight stood enshrined in the corner: a marble bust of her dead hero, carved by an Italian sculptor, Giuseppe Ceracchi, during Hamilton’s heyday as the first Treasury secretary. 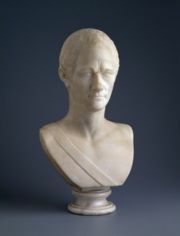 Portrayed in the classical style of a noble Roman senator, a toga draped across one shoulder, Hamilton exuded a brisk energy and a massive intelligence in his wide brow, his face illuminated by the half smile that often played about his features.